This week at Chiswick we began to explore Diwali, the Hindu festival of light, with the children through a variety of activities. First, we created some amazing firework pictures, using straws to blow different coloured paint across the paper. To do this, they experimented with different techniques to figure out how much paint was needed and how to best spread it around, blowing through the straw and using the straw to drag the paint along the paper. We then added some stones and shook them around to see if this was an effective way to create patterns like fireworks. This became the favoured way of creating fireworks and the tub was shaken energetically to create some wonderful masterpieces! For our cooking masterclass, the children created Diwali sweets using condensed milk, butter, cardamom and milk powder. They mixed the ingredients together, crushed the cardamom and used the blender to blitz the ingredients all together, which gave the mixture a creamy aromatic taste – our Little Forest Folk-ers really enjoyed tasting these treats for the first time! One of the children’s parents came in to share their experiences of Diwali, wearing traditional clothes and brought some gol guppa for the educators to try and some halwa sweets for the children to take home. It was lovely to share and be included in this family’s celebrations and for the children to learn about other cultures and religions. Our new walkie-talkies have been a real hit with the children who have been asking what they are for and how they work. 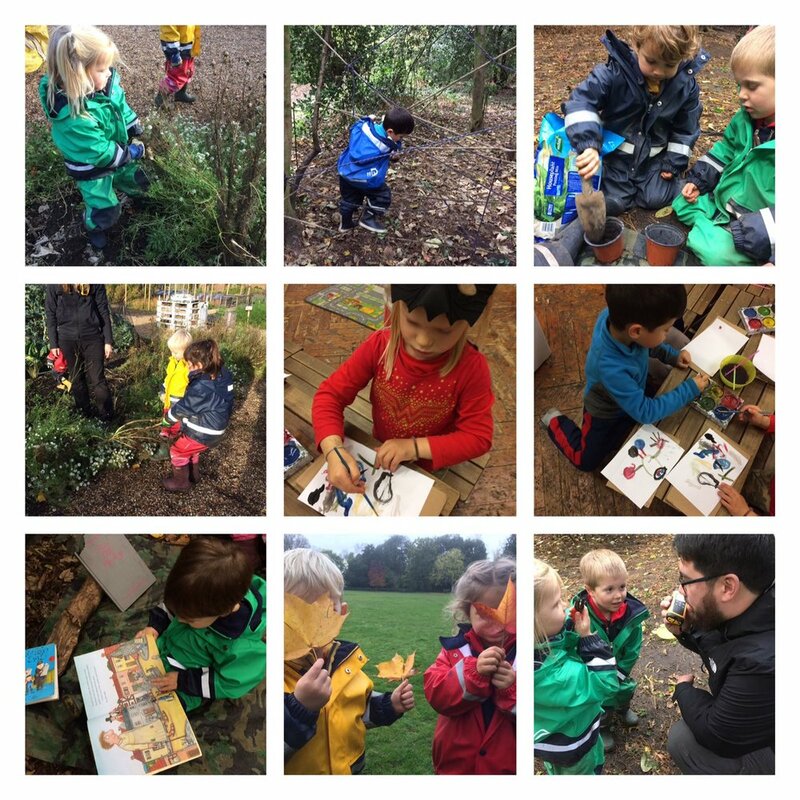 After some demonstrations of how to use the walkie-talkies, the children used sticks and tape to create their own and send messages to their friends across the forest. We also discovered that some of the pumpkin seeds from our pumpkin carving last week had sprouted so we took the opportunity to plant them in pots. The children spooned in the soil, added the seeds and then wrote their names, so that they knew which one was theirs. We are hopeful that we might be able to grow our pumpkins to plant in the allotment for next Halloween! We also went to the garden allotment to cut off and pull up some of the wild flowers that had died and add them to the compost. A great way for the children to learn about growth and change, and how the old produce will become new soil for the plants next spring. We also brought back some kale which we steamed for our dinner, yum! They all gave this new taste a try and it was considered to be a success by most of them. Older PostFulham - Fizzy Fireworks!